Jeff McHugh is a well respected talent coach from the USA and he published some great advice from anyone who works behind a microphone. As you read Jeff’s 7 things that will get you fired, I am sure you will agree with the first 6 points, and tell yourself that you would never be silly enough to make such a mistake. But I encourage you to read number 7 very carefully. This is the one that ends more careers than the other 6 combined in my experience. There are so many talented broadcasters who either do not get promoted or head hunted or even get terminated because they are too hard to work with. Don’t be that person. As a lifelong fan and coach of media personalities, I am sad when talented people shoot their career in the foot. We all know that you will inevitably offend somebody if you are being authentic and entertaining, but the line keeps moving. Career-ending mistakes usually involve egregious content and/or workplace behavior. When it comes to content, some complain that today’s politically correct audiences can be oversensitive to edgy humor that used to get laughs. Many times an audience member is concerned that someone might be offended and it kills their own appreciation of the content. If that concerned audience member is one of your advertisers…guess what happens next? Great entertainers know it is the audience’s perception of the content that matters. When smart players’ content is offensive or hurtful, they change it. The world is evolving into a more inclusive place, and you evolve with it. How you interact with others off-air is important. When I started in broadcasting in the 1980s, there were fewer lawyers, corporate suits, and HR rules. Many of us behaved like drunken louts. Let’s learn from the mistakes of others. Here are seven easily avoidable transgressions that cost some talented media personalities their job or reputations. 1. Violence as content. Kathy Griffin’s photo holding a severed, bloody head of President Trump was beyond the pale. Severed, bloody body parts were funny in the black knight scene from “Monty Python and the Holy Grail.” A fictional character and ridiculous premise is safer than a real-life sitting President with a polarizing personality. 2. Racism. Bill Maher made a poor decision to use the N word in an off-the-cuff joke, and that word has been off-limits for some time. So has “yellow,” as Australian personality Red Symonds learned last week while interviewing an Asian woman. The Greaseman’s spectacular radio career ended permanently in 1999 because of his inability to stifle racially offensive content. Anything based on negative group generalizations is a bad idea. How sensitive are things today? Reporter Katie McHugh was fired recently for tweeting hate about Muslims… from the alt-right-friendly/Muslim-unfriendly website Breitbart! 3. Falsehoods and lies. Sean Hannity began losing sponsors when he knowingly pushed a false conspiracy theory about a murdered Democratic employee. Alex Jones, whose radio show is known for fantastical conspiracy theories (he’s the guy who claimed the Sandy Hook massacre never happened), was sued and had to apologize for lies he broadcast about Chobani Yogurt. It happens in the mainstream media too. Remember Brian Williams, banished from NBC to MSNBC for “misremembering” being in a helicopter that was shot down? And remember Dan Rather, disgraced for not fact-checking a George W. Bush story for the CBS Evening News. 4. Threats and abuse. CBS Philadelphia reporter Colleen Campbell went viral recently with her tirade and physical assaults against police officers on the street. Troi Torain, aka “Star” was fired from WWPR New York after threatening the child of DJ Envy at Hot 97. That was 2006. He has not been back on AM/FM radio since. 5. Sexual-harassment and assault. Bill O’Reilly, Roger Ailes, Gian Gomeshi at the CBC. Everyone should keep their hands and any gender-specific commentary to themselves. 6. Drugs and alcohol. We showbiz folk get a little more leeway than your average accountant, but far too many act as if it is the Burning Man festival at work. Your talent cannot shine if you are high. If you are at a work or client party, aspire to be the most sensible person there. 7. Being uncoachable. It is not “your” show. The show belongs equally to cohosts, producers, program directors, music directors, promotion directors, website managers, social media directors, market managers, vice presidents, presidents, and (a tiny bit) to your talent coach. 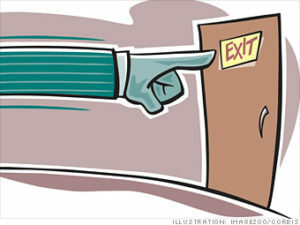 There are many tragic stories of high-profile personalities who lost it all because they wouldn’t listen to good advice. At the close of the Conference session at the Western Association of Broadcasters 83rd Annual Conference in Banff, Alberta on June 8th, 2017, Karl Johnston, WAB Vice President made a special early announcement on behalf of the board of directors for next year’s Conference. “Our Keynote Speaker in 2018 is someone many of us in the industry have been hearing about and we believe its very timely for us to invite him to join us in Banff. 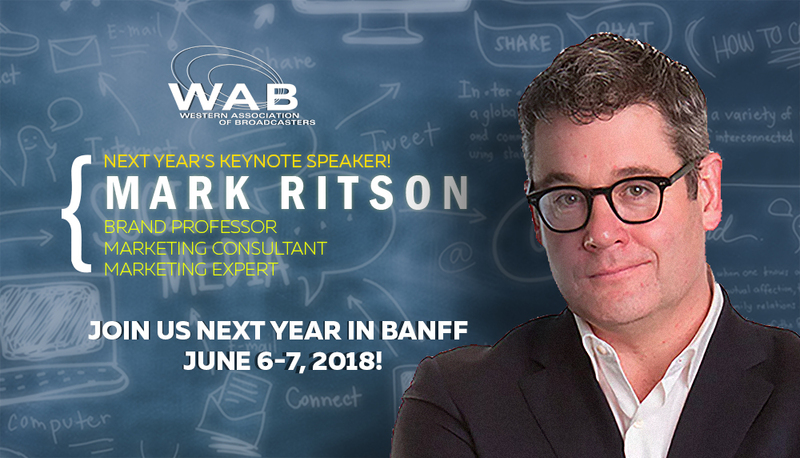 We are very pleased to bring Mark Ritson to Banff from June 6-7, 2018!”. Mark Ritson is the adjunct professor at Melbourne Business School and everyone’s favourite contrarian. He thinks the value of social media is grossly overstated. He says social media is a tactic not a strategy. He speaks to the importance of strategy when we work with advertisers. He also says all media is now digital and he will urge us to stop saying we’re traditional media. Your sales executives should come to hear this important message. The 2018 WAB Conference will be a game-changer. Don’t miss this opportunity to hear this world-leading expert in marketing and branding. Sign up at www.wab.ca to join the mailing list to get up to date news on next year’s thought-provoking and powerful WAB Conference. Early registration will open in September along with the release of other world-class speakers. Stay tuned! The Western Association of Broadcasters is an association of and for the private radio and television stations of Alberta, Saskatchewan and Manitoba. Members represent the best and brightest in Western broadcasting. Their annual WAB Conference is one of the premier, must-attend broadcasting events in Canada – bringing together the key Canadian decision-makers, executives and regulators in our industry every June for networking, impactful and dynamic speakers. Recent keynote speakers have included Lloyd Robertson, Bob Hoffman, Terry O’Reilly and 2017’s Amanda Lang. Non-members across Canada are also welcomed to attend their annual WAB Conference. For more information on the Western Association of Broadcasters please visit www.wab.ca. The Chairman of the Canadian Radio, Television and Telecommunications Commission gave a farewell speech to his staff in Ottawa today (16 June). He talked about achieving goals and congratulated the staff on a job well done. He mentioned television in passing and talked about broadband (Telecommunications), but there was no mention about radio in his speech. Remember the organisation he worked for for the past 5 years is called the RADIO, Television and Telecommunications Commission. But alas no mention of radio. We wish you well John-Pierre, and can only hope that the next leader of the C.R.T.C. will care about all areas of the communications business in Canada. As a radio creator, I am very proud of the difference radio makes in the lives of average Canadians. Here is what he said in his speech today: Good morning. It’s an honour for me to stand before all of you for one last time. To reflect on everything we’ve done and everything we’ve accomplished over the past five years. But most of all to thank you all for your exceptional work. I feel rewarded for the last five years of my work. You should too. Together, we’ve made important changes to the country’s communication system and positioned it for success now and well into the future. In 2017, I see the CRTC as an institution that is trusted by Canadians. They trust us to ensure that Canada maintains and develops a world-class communication system. They trust us to defend their interests as citizens, as creators and as consumers. In our case, trust is the by-product of doing the right thing. Of making the right choices that set up Canada’s communication system—and Canadians as consumers, creators and citizens within that system—for success in the face of change on a never-before-imagined scale. That’s the vision I put forward. And it’s exactly what we did. Almost from day one of my term, we imagined new approaches to consultations that brought Canadians directly into the centre of conversations about issues of fundamental importance to their daily lives: wireless services, television content and broadband connectivity. In so doing, we greatly expanded and diversified the public record upon which my fellow Commissioners and I rendered our decisions. Dozens of voices became hundreds. Hundreds became thousands. Even more followed—from all parts of the country and all walks of life. That work, by the way, has not gone unnoticed. Many of you in this room have won prizes for the work you’ve done to help the CRTC better engage with Canadians and for the resulting policy decisions. More than this, other departments and agencies of the Government of Canada have followed our lead. Be proud of that fact. Imitation is the sincerest form of flattery. In our consultations with Canadians, we learned that the old way of doing business—broadcast quotas, points systems, co-production treaties and other hallmarks besides—mattered less and less in this on-demand, consumer-centric age. Television as a medium is being radically transformed by broadband. The system that supports it had to change too. That’s exactly what we did. 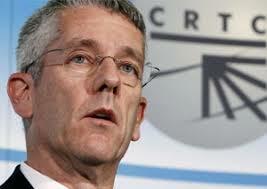 Underpinning all these changes—within the CRTC and across the industry—is broadband. I said as much in my address to the Banff World Media Festival on Tuesday. Broadband is more than just a conduit to entertainment, government services, healthcare, education or even democracy. It’s the very technology that enables these things. It’s why we now talk in terms of living in a digital world. Enabling access to broadband and shaping the way in which that technology is brought to, and used by, consumers was a recurring theme during the last five years. It was the reason for our decisions on net neutrality, on basic telecommunications services, and even the decision we released earlier yesterday on the review of the wireless code. I’m proud of what we’ve accomplished as a group over the past five years. I’ll look back on this period of my career fondly. Back in 2012, I set an ambitious plan for change for this organization and I can honestly say that we achieved those goals—with hard work and dedication. I hope you’re just as proud of what we’ve achieved together. It hasn’t always been easy. Many people have thrown cold water on our decisions. Often, they’re those who never participated in our hearings or contributed to the public record. They’re those who stand at the back of the crowd and criticize our decisions after the fact. I urge you to continue to think and talk about solutions. To continue to lead. Some of you have asked whether I want to stay in this job past the end of my term. The answer is no. I haven’t applied because I’ve done what I set out to do five years ago: to put the CRTC back on the path of building trust with Canadians and developing a world-class communication system with Canadians at its centre. This, by the way, is the same reason why I’m still here with only two days left in my mandate. To leave any earlier—prior to our decision on the review of the wireless code—would have been to leave a job unfinished. Yesterday’s decision lays that capstone. It’s the final reward of a job done well. Any of you who have visited my office will have seen this figurine. It’s of Merlin, that ancient wizard of Arthurian legend. In his acclaimed account of the life of King Arthur, The Once and Future King, T. H. White imagines Merlin as someone who experiences time backwards. Merlin knows the future. He’s lived it already. This is why he’s the ideal mentor for the king to be. Merlin was an inspiration for me during my term as Chairman. His presence kept me focused on my vision. After all, he already knew that we would achieve it together! No changes in the top 5 places n Vancouver. The CBC retain their hold on the top spot in Vancouver but are down slightly from the previous measurement period. Bell’s Hot AC QMFM lost some audience but hold onto #2. The Corus talker CKMW is #3 and sister station Rock 101 is up slightly but holds at #4. Rounding out the top 5 is Bell’s CHR Virgin Radio. CJJR-FM is up a spot to #6 as is Newcap’s LG104 to #7. Dropping two places this time around is the Rogers News talk station CKWX. The Newcap mix station Z95 had a nice bump and is up to place to #9. CHFI retains the top spot and for the second book in a row, is the only station in Toronto to be in double digits. 97.3 Boom are up a full point from the last measurement period and are tied for second place with the CBC. CHUM-FM are also up a full point but remain in the #4 spot in Toronto. Q107 were also up a full point for 7th spot. 6 stations improved their overall position, 7 went down, and 12 stayed the same. No changes in the top 10 positions in Montreal. Bell’s CJAD keeps its hold on the #1 spot, and still control more than ¼ of all the tuning in the market. Cogeco’s Beat 92.5 (CKBE-FM) is static at #2 and grew cume, while at #3 is Bell’s Virgin Radio (CJFM-FM). Also stable at #4 is CHOM and the CBC round out the top 5. Bells TSN AM Sports station is #6, while Cogeco’s Rhythm 105.7 (CFGL-FM)holds at #7. Only 2 stations in this market improved their rankings, 2 slipped and 15 remained in the same position. No changes in the top 3 spots. The Corus all news station CHED hangs onto the top spot in Edmonton. 102.3 NOW! (CKNO-FM) is up a touch and the Corus owned Country station CISN grew audience. The CBC jumped 3 places to #4. 50,000 Watt AM country station which dropped 2 spots to #8. The Bell Rocker, CFBR (The Bear) had a nice bump jumping 2 places to #9. Rounding out the top 10 is the Pattison owned station CIUP. Overall, there were 6 stations that improving their position., 6 stations drooped and 7 remained static. The CBC hangs on to the top spot in Calgary. Static at #2 is the Rogers owned Newstalk 770 station (CHQR). The Corus Country station (CKRY-FM) is #3. Staying solid in #4 but growing audience is Newcap’s XL 103 FM (CFXL-FM). Next is the Corus rocker Q107 (CFGQ) up a spot to #5. Jack FM jumped 2 spots to take #6. Sister station 660 News (CFFR) holds steady at #7. The Rawlco soft rocker @ 97.7 (CHUP-FM) improved to #8th while the Rogers CHR Kiss (CHFM-FM) shed some audience to settle into 9th spot. Rounding out the top 10 is CJAY the Bell Classic Rocker. Overall, there were 5 stations improving their ranking, 4 stations went down and 9 stayed the same.